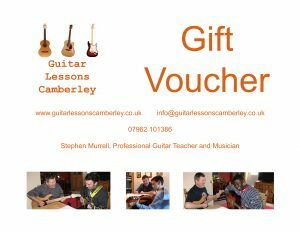 Guitar lessons and ukulele lessons are provided by Stephen Murrell, a friendly, patient and passionate local guitar teacher. He has helped many aspiring guitar players to reach their full potential, hone their skills and pass proficiency exams. Whether you dream of playing jazz, pop, blues, metal, folk, classical or rock guitar, I can tailor my lessons to suit your style and area of interest. I will help you with every aspect of learning the guitar, from reading sheet music and tabs, to teaching improvisation, rhythm and chords. 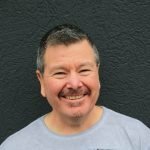 Whether you wish to learn on an electric, acoustic, classical guitar or ukulele, I can advise you on best practices and techniques for your instrument of choice. Playing the guitar is my passion. I am an experienced and qualified guitar teacher. I have been enjoying playing the instrument for over 40 years, now that’s dedication! Teaching is done in private from my home in Sandhurst near Camberley. I have previously taught at prestigious music schools such as Yamaha Music Schools, Hampshire Music Service, Berkshire Maestro’s and Thames Valley University. I continue to teach in local schools and colleges such as Wellington College and Bearwood College. 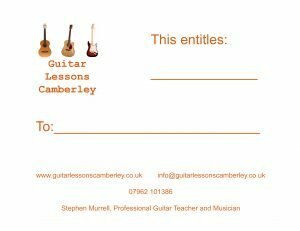 I am based in Sandhurst and offer guitar lessons and ukulele in Camberley, Wokingham, Bracknell, Fleet, Crowthorne, Blackwater, Bagshot, Ascot, Finchampstead, Yateley, Farnborough, Farnham, Aldershot, Hook, Lightwater and the surrounding Berkshire, Surrey and Hampshire areas. Get in contact. Just £18 for a 30 minute lesson or £35 for a 1 hour lesson. To book your first lesson or for more information get in contact. Call Guitar Lessons Camberley now on: 01276 341 56 or 07962 101 386. Pay for 10 lessons in advance and get 10% off. 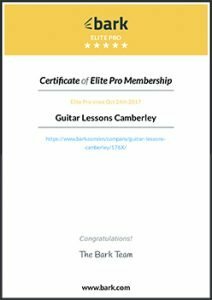 Click on Certificate below to view Guitar Lessons Camberley Bark Elite Pro profile and details. I'm delighted to offer a reference for your teaching, for which I am most thankful. Steve first took me as a pupil in the middle of 2008. Up until then I had been a typical self-taught guitarist for about 25 years, and really I needed to have a much better understanding of the basics of what I was doing, in order to improve, whilst recognising that family and business commitments would limit the time I had available. Over the last two years Steve has completely changed the way I feel about guitar and the way I go about practice and preparation, and I intend to build on this with his help. I now enjoy playing far more than I ever realised I could, and I have no hesitation in recommending anyone to seek out Steve's help regardless of their current level, from beginner to long-time player. I'm delighted to offer a reference for your teaching, for which I am most thankful. Steve first took me as a pupil in the middle of 2008. Up until then I had been a typical self-taught guitarist for about 25 years, and really I needed to have a much better understanding of the basics of what I was doing, in order to improve, whilst recognising that family and business commitments would limit the time I had available. Over the last two years Steve has completely changed the way I feel about guitar and the way I go about practice and preparation, and I intend to build on this with his help. I now enjoy playing far more than I ever realised I could, and I have no hesitation in recommending anyone to seek out Steve's help regardless of their current level, from beginner to long-time player. Our son, James, has been having weekly alternate acoustic and electric guitar lessons with Stephen Murrell for just over a year now. Stephen is a fantastic tutor who has a calm manner about him and he fills James with confidence and enthusiasm. James has already passed his Trinity Initial Guitar examination with Merit and he is well on his way to taking his next examination! Our son, James, has been having weekly alternate acoustic and electric guitar lessons with Stephen Murrell for just over a year now. Stephen is a fantastic tutor who has a calm manner about him and he fills James with confidence and enthusiasm. James has already passed his Trinity Initial Guitar examination with Merit and he is well on his way to taking his next examination! My son who is 9, has played at being a rock star ever since my mother gave him a toy electric guitar for Christmas. When that broke we decided we would risk buying him a real one. He loved it but couldn't really do much with it and became bored. Then we found Stephen Murrell through the Sandhurst Directory. He has 25 years experience of teaching youngsters including being a tutor for Berkshire Young Musicians Trust and is employed by Yamaha Music Schools to teach both adult and youth groups. He teaches all styles, at all levels and all ages. He takes his guitar lessons very seriously but most of all, he likes his lessons to be fun. Amazingly, we still have a cream egg in our fridge from Easter because Steve taught my son to play the National Anthem using the egg to 'slide' across the frets. Nobody is allowed to eat it. There is no doubt that my son loves his lessons with Steve. It is the one appointment that he is absolutely ready for and, on time! When I go to collect him, I feel as though I am going to have to drag him away as I watch them both engrossed in guitars and music (and chocolate eggs, evidently). My son has not only gained a lot of confidence from all this but also a lot of 'street cred' with his peers! As for me, whilst I would love to have guitar lessons with Steve I think I'll just invest my money in my son. After all, he has promised to buy me a Porsche when he is famous - move over Elvis. My son who is 9, has played at being a rock star ever since my mother gave him a toy electric guitar for Christmas. When that broke we decided we would risk buying him a real one. He loved it but couldn't really do much with it and became bored. Then we found Stephen Murrell through the Sandhurst Directory. He has 25 years experience of teaching youngsters including being a tutor for Berkshire Young Musicians Trust and is employed by Yamaha Music Schools to teach both adult and youth groups. He teaches all styles, at all levels and all ages. He takes his guitar lessons very seriously but most of all, he likes his lessons to be fun. Amazingly, we still have a cream egg in our fridge from Easter because Steve taught my son to play the National Anthem using the egg to 'slide' across the frets. Nobody is allowed to eat it. There is no doubt that my son loves his lessons with Steve. It is the one appointment that he is absolutely ready for and, on time! When I go to collect him, I feel as though I am going to have to drag him away as I watch them both engrossed in guitars and music (and chocolate eggs, evidently). My son has not only gained a lot of confidence from all this but also a lot of 'street cred' with his peers! As for me, whilst I would love to have guitar lessons with Steve I think I'll just invest my money in my son. After all, he has promised to buy me a Porsche when he is famous - move over Elvis. Steve is a fantastic teacher. He taught My daughter to play and read music from the age of 6 when we lived in Sandhurst. I highly recommend Steve for any level of ability. "Stephen is a skilled and dedicated guitar teacher and musician. I went to him for guitar lessons and learnt a great deal. He was patient and encouraging when I was struggling to understand some of the music theory and chord construction. I recommend him to anyone who wants to improve their guitar playing, including those who are new to the guitar, as well as those with more experience. Everyone who has guitar lessons with Stephen will benefit from his teaching." It is without hesitation that I provide a written reference for Stephen Murrell, musician and guitar tutor. Mr Murrell has been teaching my son classical guitar for 18 months on a weekly basis. During this time Stephen has shown an exceptionally professional approach to teaching, yet with the ability to adapt his teaching style to suit the needs of my son, who, at the age of 8, requires a fun yet structured approach to his lessons. With Stephen's expert tuition Matthew obtained a Merit (85/100) for his grade 1 exam within his first year, a reflection no doubt of the excellent tutoring he received from Stephen. My son attends Yateley Manor Independent Day School and Stephen came highly recommended to us as a private tutor by several of the parents. Since our son has taken up tuition with Stephen we, likewise, have recommended him to other friends/parents at the school. His professional and pleasant, friendly approach together with his enthusiasm for teaching all styles of guitar (electric, acoustic and classical) make him a highly recommended guitar tutor. All feedback from parents and children, has been most positive and complementary and I have no reservation/hesitation in providing this reference. It is without hesitation that I provide a written reference for Stephen Murrell, musician and guitar tutor. Mr Murrell has been teaching my son classical guitar for 18 months on a weekly basis. During this time Stephen has shown an exceptionally professional approach to teaching, yet with the ability to adapt his teaching style to suit the needs of my son, who, at the age of 8, requires a fun yet structured approach to his lessons. With Stephen's expert tuition Matthew obtained a Merit (85/100) for his grade 1 exam within his first year, a reflection no doubt of the excellent tutoring he received from Stephen. My son attends Yateley Manor Independent Day School and Stephen came highly recommended to us as a private tutor by several of the parents. Since our son has taken up tuition with Stephen we, likewise, have recommended him to other friends/parents at the school. His professional and pleasant, friendly approach together with his enthusiasm for teaching all styles of guitar (electric, acoustic and classical) make him a highly recommended guitar tutor. All feedback from parents and children, has been most positive and complementary and I have no reservation/hesitation in providing this reference. "Stephen Murrell has been teaching my son Jack, who is age 11, electric guitar for approximately 2 years. A natural teacher, Stephen is calm, kind and patient. Jack very much looks forward to his lessons and describes them as "great fun". he always returns home full of enthusiasm and extremely motivated. Stephen has always been reliable and teaches to an exceptionally high standard. I would not hesitate in recommending Stephen for guitar tuition." "Stephen Murrell has been teaching my son Jack, who is age 11, electric guitar for approximately 2 years. A natural teacher, Stephen is calm, kind and patient. Jack very much looks forward to his lessons and describes them as "great fun". he always returns home full of enthusiasm and extremely motivated. Stephen has always been reliable and teaches to an exceptionally high standard. I would not hesitate in recommending Stephen for guitar tuition."